Hacking Managing News, part 2: Monitoring topics | There's a module for that! Compared to Tattler, one of the weaknesses of Managing News is the lack of topic monitoring - where a user inputs a keyword phrase representing a topic and the system takes care of tracking this topic across pre-selected RSS sources. Soon after we started using Managing News, this requirement came up. I spent some time understanding BuzzMonitor, the module that implements topic monitoring in Tattler, and then wrote the more boringly-named Feeds Topics to achieve the same thing using Feeds and Managing News. Here's a recipe of how to integrate Feeds Topics with Managing News. The easiest way is to download the attached MN Topics feature directly! But if you want to know the details, read on. The following modules are required: Feeds Topics, Rules, Views Custom Field. Apply a patch to Feeds to update FeedsFeedNodeProcessor. Create a Topic content type. Create a new view mn_topic_news that is a clone of mn_news. While I won't go into details since the feature is available, I'd like to highlight one major difference: Since we want to display the topic name in the articles list, we need to relate the article to its grand-parent, the topic. This is achieved by adding a relationship between Feed nid (the parent feed) to its owner topic. Create new contexts mn-section-topics and mn-section-topics-notrash that are clones of mn-section-news and mn-section-news-notrash, respectively. The main differences involve choosing the views above and setting the menu item to Topics. * Action function for feeds_import_topic_action. // Import the parent topic by creating the child feeds. // Import each child feed. // Remove feed from scheduler and delete source. // user created by hand. Feeds Topics is still a work in progress, so your feedback here or in the module's issue queue is appreciated! Feeds importer in my installation does not show 'null fetcher' and 'topic parser'. I have installed the modules listed above. I cant add a new Topic. The button on the image shown on this page "Add Topics" not in my installation. Also concerned by the administrator menu but stays blank page after trying to add it. I think the problem I have it in the patch. I do not understand how it applies the patch and where I have to apply. You need to include the code in the section "Automating feed aggregation on topic creation" above into your own module. You say "$ cd sites/all/modules/feeds". If it is correct, first i have to install modules feeds in thay directory, its that ok? Or the patch apply to modules/contrib/feeds ? It Works! ...and its useful. I've applied the feature successfully at irienews.net and the site really comes alive. To deal with a few glitches I had to manually create the mn_topics view edit the mn-sections-topics context. After that it seem to work, though Im still testing it. I hope this feature can become a part of the Managing News Distro. I have a development site that I wish to apply this feature to. I have minimal experience with features and the managingnews profile is an exciting learning experience for me. This is what I have done so far: I downloaded mn_topics-6.x-1.0.tgz, untarred the file, then uploaded the resulting mn_topics folder into profiles -> managingnews -> modules -> features folder. I also downloaded the following modules: Feeds Topics, Rules, Views Custom Field. These modules I placed into profiles -> managingnews -> modules -> contrib. I enabled them through the admin interface. I do not have shell access to this site until Saturday so I am working through gFTP, cpanel, or the admin interface at the site itself to do all of the work. Rest assured on Saturday, drush moves in. How do I apply this feature? I did all of this as well as the patch, but the option to add a topic is still not there. Suggestions? Managing News and Feeds have moved on since this article, so you probably have to manually check the code and configuration to make it happen. I did find this feature to enable in the Features section of Admin (duh) so I enabled it. When I enabled it, did it apply the patch automatically? You need to apply the patch manually. Since you don't have access to SSH on the host, you need to download the file, patch it locally, then re-upload it. Missing Feeds plugin FeedsFeedNodeProcessor. See topics. Check whether all required libraries and modules are installed properly. warning: call_user_func_array() expects parameter 1 to be a valid callback, function 'FeedsMissingPlugin_feeds_form' not found or invalid function name in Z:\home\mnews\www\includes\form.inc on line 377.
and there is no FeedsFeedNodeProcessor plugin to choose. Both Feeds and ManagingNews have changed since that article was written about a year ago, so I expect you will have to spend some effort adapting the technique to today's versions. 2 month ago i have not got it done - now I tried to use latest version of Feeds dev and latest feeds_topics and it works! Import from sources works properly: to all who use it i should say dont forget to run cron. Only one little trouble: no view on address /topics and no tags attached to feed items. All works with my custom module and without any patching. Its unfortunate that this is not incorporated into the current version. As the previous commenter stated it really seems to make a site come alive. If anyone updates this feature it would be great to have it submitted. 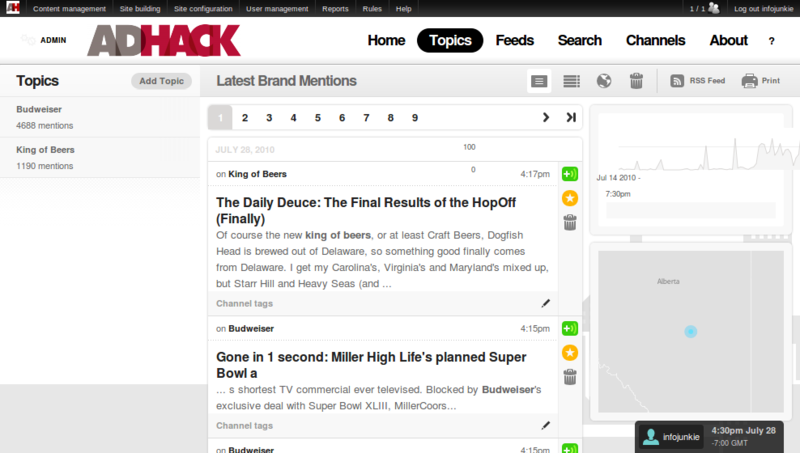 You can always request the integration of Feeds Topics into the Managing News install profile on their issue queue.